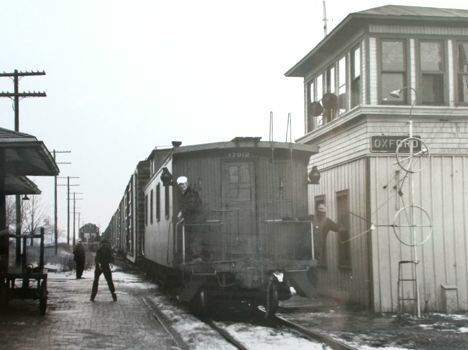 The earliest known crossing of any two railroad lines in Michigan was in 1840 at Lenawee Junction in Lenawee County. The "Southern" line was being built west from Monroe and it crossed the Jacksonburgh branch of the Erie & Kalamazoo about five miles east of Adrian. It is likely that there were other rail crossings of yard tracks in Detroit, but this rural crossing is the first documented. In early times, crossings were unmarked or perhaps a ball signal was raised on a pole at the crossing to indicate which road had the right-of-way. This is where the term "highball" came from which instructed engineers to proceed. In many cases, trains ran slowly and they were required to stop before proceeding at a crossing once it was known that the way was clear. But as fate would have it, weather and visibility could be poor, engineers did not heed speed restrictions, and crashes became common and deaths occurred. Crossing protection became increasingly sophisticated. Ball signals were raised higher and lighted at night for better visibility. Gates were installed. Crossing watchmen were deployed. Ball signals were replaced by semaphore signals and advance semaphores were placed farther down each track to give advanced warning of the crossing as train speeds increased. Around the 1870's, the interlocking device was invented in England and brought to the United States. These interlocker machines were located in a tower at the crossing. Interlockers controlled crossing rights, signals and switches within the interlocking limits so that it was not possible for trains to interfere with each other. About the same time, "derails" were deployed near the crossing, the theory being that it was better to derail a train rather than allow it to enter the crossing and possibly strike an opposing train. One of the deadliest interlocker accidents occurred in February 27, 1921 at Porter, Indiana when a Michigan Central passenger train crew mistook a green train order signal for a proceed indication at night. The train struck a westbound New York Central passenger train derailing everything, killing 37 and injuring 20. Miraculously the tower and it's operator came out unscathed. Interlockings came in various sizes and styles. Most were "armstrong" machines - named after the strong arms of the operator or leverman that had to move switches by brut force from levers in the tower. These strong arm levers were connected to switches, signals, derails and locks by an intricate pattern of pipes which protruded from the base of the tower and in some cases went over 100 feet to the switch. Some towers had 75-80 levers. Others had as few as 6, It just depended how complicated the crossing and wye tracks were in the "plant", a term used to describe the machine and it's control area. Other interlocking frames were small and set in the ground at the crossing and operated by trainmen. Over time, some interlockers became higher tech and were powered by electric or pneumatic (compressed air) operation. Early on, some signals (and even distant signals as far as 1,500 feet away) were controlled by movable wire instead of pipe. But these proved to be a maintenance headache and were replaced by pipe control or even electrical control as motors became available for semaphore signals. For low speed branch lines, distant signals were modified to be fixed in the approach position. Relay control of interlockers became more common after World War II and centralized traffic control (CTC) was invented allowing one operator or dispatcher to control a series of control points and crossings while cutting labor costs. Early CTC models (known by other names as well) operated using electric pulse operation of relays through a "code line" along the track (buried or on poles). These began to be replaced by microprosser control in the 1960's using wire and microwave control, radio, satellites and the internet. At one point, the CSX railroad controlled most of its lines through a single, remote control dispatch center located in Jacksonville, Florida but this was later decentralized for redundancy purposes and to get dispatchers closer to the customer. Most interlocking towers were manned by a single operator. In busy urban areas like West Detroit or the MCRR depot interlockers (20th and 15th Streets), the tower was in the charge of a traffic director and one or two leverman who moved the levers. Some interlockers in low volume branch line crossings were manned on only one shift or not regularly manned at all. Some, like Tesch west of Escanaba, were literally in the middle of nowhere. In the days before automobiles, this must have made getting to work a challenge. Other towers, like Lakeland in Hamburg Township in Livingston County were scenic. Lakeland was next to a beautiful lake and summer beach resort and working the tower must have been a pleasure. Individual crossings and interlockers are located in the Stations and Locations category. But the are listed below by city/location name and county for reference purposes. Tesch - C&NW / Soo - Wood tower. Jonesville - LS&MS / LS&MS - Fort Wayne Jct. Milwaukee Jct. - C&NW / DSS&A / MILW - Republic? Petersburg - DT&I / LS&MS - Petersburg Jct. Muskegon - GR&I / PM - Fruitport Jct. Pontiac - GTW / Electric - South Blvd. Vassar - MC / PM - Vasser Jct. Dearborn - MC / MC - Town Line (shanty at junction) "J"
Detroit - DT / GTW - Ford Jct. Porter - MC / LS&MS / E&JE / PM - Porter Interlocking Tower "PO"